The Madheshi agitation of 2007 and the Tharuhat agitation of 2009 redefined the ethnic relation between the self-identifying Tharu and Madheshi communities. At that time, the Tharu not only contested Pahadi (hill-origin) identity but also vehemently confronted the increasing hegemony of Madheshi caste groups by challenging the notion of Madhesh, Madheshi labelling, and the demand for a single Madhesh province across the Tarai, as put forward by the Madheshi community. Tharus that enthusiastically participated in the 2007 Madheshi agitation, appeared to be against the same identity just two years later. Why did they turn around? This article argues that the Tharu sensed the systematic initiation of Madheshisation of their centuries-long indigenous identity, while Madheshi activists and leaders undermined the concept of the Tharuhat, Tharu language and culture, by continuously insisting on the Madheshi label, a Madhesh province, and the Hindi language. Their eventual challenge to the Madheshi label raised questions about the legitimacy of the Madheshi agitation, a fact that some Madheshi leaders claim is political blackmail. This article seeks to bring out the Tharu-Madheshi contestation in relation to identity claims and state restructuring in Nepal, particularly with reference to the Tarai. ACHR. 2009. Madhes: The challenges and Opportunities for a Stable Nepal. New Delhi: Asian Centre for Human Rights. Bista, D. B. 1991. Fatalism and Development: Nepal's Struggle for Modernization. Patna: Orient Longman Ltd.
Burkert, C. 1990. Defining Maithil Identity. In Nationalism and Ethnicity in a Hindu Kingdom: The Politics of Culture in Contemporary Nepal (eds) D. N.
Gellner, J. Pfaff-Czarnecka, & J. Whelpton, 241-273. London: Routledge. CBS. 2012. National Population and Housing Census 2011 (National Report) Vol. 01. Kathmandu: Central Bureau of Statistics, Nepal. CBS. 2014. Population Monograph of Nepal 2014: Volume I (Population Dynamics). Kathmandu: Central Bureau of Statistics. Cheah, F. 2008. Inclusive Democracy for Madheshis: The Quest for Identity, Rights and Representation. Singapore: Institute of South Asian Studies. Chudal, A. A. n.d. Vice President Jha’s Oath in Hindi: Response to Hindi in Nepal (available on-line: http://martinchautari.org.np/files/Vice_President_Jhas_Oath_in_Hindi_Response_to_Hindi_in_Nepal_by_Alaka_Atreya_Chudal.pdf, accessed 16 March 2014). Gaige, F. 2009 . Regionalism and National Unity in Nepal. California: The University of California Press. Guneratne, A. 1994. The Tharus of Chitwan: Ethnicity, Class and the State in Nepal (Unpublished PhD Thesis, University of Chicago). Guneratne, A. 2002. Many Tongues, One People: The Making of Tharu Identity in Nepal. New York: Cornell University Press. Guneratne, A. 2009. Tharu-state Relations in Nepal and India. Himalaya, the Journal of the Association for Nepal and Himalayan Studies, 29(1), 19-28. Hachhethu, K. 2007. Madheshi Nationalism and Restructuring the Nepali State. A paper presented at an international seminar on Constitutionalism and Diversity in Nepal organised by Centre for Nepal and Asian Studies, TU. Kathmandu. Hachhethu, K. 2009. Research brief: State and ethnicity. Kathmandu: Social Inclusion Research Fund. History. (n.d.). History. Madheshi Janadhikar Forum-Nepal (available on-line: http://www.mprfn.org/content.php?pageid=28, accessed 16 March 2014). ICG. 2007. Nepal's Troubled Tarai Region. Kathmandu: International Crisis Group. Jha, J. 2013. Madhesi party manifestos mum on Hill issues (available on-line: http://www.myrepublica.com/portal/index.php?action=news_details≠ws_id=63818, accessed 16 March 2014). Jha, P. 2007. Madhes rises. 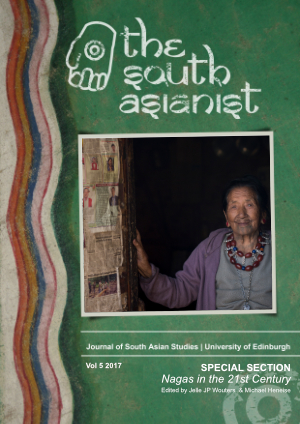 Himal South Asian 7 (available on-line: http://himalmag.com/component/content/article/1439-.html, accessed 1 Feb. 2014). Jha, P. 2009. The Tharu thrust: How to address ethnic aspirations while keeping a viable centre. Nepali Times (available on-line: http://nepalitimes.com/news.php?id=15754#.UuyTR7SCZG4, accessed 1 Feb. 2014). Kharel, P. 2013. Sadbhawana Party unveils manifesto. ekantipur (Oct. 19) (available on-line: http://www.ekantipur.com/2013/10/19/top-story/sadbhawana-party-unveils-manifesto/379495.html, accessed 1 Feb. 2014). Krauskopff, G. 2008. An 'Indigenous Minority' in a Border Area: Tharu Ethnic Associations, NGOs and the Nepalese State. In Resistance and the State: Nepalese Experiences (ed) D. N. Gellner, 199-243. New Delhi. Madhesis demand Hindi as common (2011, April 15). The Times of India (available on-line: http://articles.timesofindia.indiatimes.com/2011-04-15/allahabad/29421068_1_language-row-nepal-s-terai-madhesi, accessed 1 Feb. 2014). Mathema, K. B. 2011. Madheshi Uprising. Kathmandu: Mandala Book Point. Maycock, M. 2011. The Influence of the Tharuhat Autonomous State Council (TASC) in a Kailali in the Far-Western Region. Nepal Journal of Social Science and Public Policy, 1, 78-89 (available on-line: http://www.nepalpolicynet.com/new/new-angle/cat-new-angle-2011/the-influence-of-the-tharuhat-autonomous-state-council-tasc-in-kailali-district-in-the-far-western-tarai/, accessed 1 Feb. 2014). MJF-L. 2013. sambidhan sabha nirwachan ghosanapatra 2070 VS [Constituent election Manifesto 2013]. Kathmandu: Madheshi Janadhikar Forum-Loktantrik. MJF-Loktantrik proposes two provinces. (2013, Oct 28). ekantipur (available on-line: http://www.ekantipur.com/2013/10/28/top-story/mjf-loktantrik-proposes-two-provinces-in-madhes/379984.html, accessed 1 Feb. 2014). Nayak, N. 2011. The Madhesi Movement in Nepal: Implications for India. Strategic Analysis, 35, 640-660. NSP. 2013. nirwachan ghoshanpatra 2070 VS [Election Manifesto 2013]. Kathmandu: Nepal Sadbhawana Party. Pathak, B., & Uprety, D. 2009. Terai-Madhes: Searching for identity-based security. Kathmandu: Conflict Study Centre. Ranjitkar, S. B. (2009). Tharus’ Movement Against Madheshi Label (available on-line: 66.7.193.115/news-analysis-and-views/tharus2019-revolution-against-madheshi-label, accessed 1 Feb 2014). Saferworld, Small Arms Survey, Interdisciplinary Analysts and Nepal Madhes Foundation. (2011). Armed Violence in the Tarai. Shah, S. G. 2007. Dialogue for Peaceful Resolution of Madheshi Movement (available on-line: http://madhesi.wordpress.com/2007/02/04/dialogue-for-peaceful-resolution-of-madheshi-movement/, accessed 1 Feb. 2014). Sheppard, J. 2009. Federalism in Nepal: A Tharu Perspective. Contributions to Nepalese Studies 36, 213-237. Singh, R. S. 2010. The Unmaking of Nepal. New Delhi: Lancer Publishers and Distributers. Tharu Community Protest Jha's use. 2008. ekantipur (26 July) (available on-line: http://www.ekantipur.com/2008/07/26/top-story/tharu-community-protest-jhas-use-of-hindi/154861.html, accessed 1 Feb. 2014). Tharu, S. n.d. Tharu andolan ra netritwo ko prashna (Tharu Movement and the issue of the leadership). Tharuwan (available on-line: http://www.tharuwan.com/, accessed 16 Mar 2014). Tharus demand their removal from. (2014, April 23). The Himalayan Times (available on-line: http://www.thehimalayantimes.com/fullNews.php?headline=Tharus+demand+their+removal+from+Madhesi+list&NewsID=412626&a=3, accessed 28 April 2014). TMLP. 2013. sambidhan sabha nirwachan ghosanapatra 2070 VS [Constituent Assembly election manifesto 2013]. Kathmandu: Tarai Madhesh Loktantrik Party. TSSS. 2009. Press Meetings of April 17th. Kathmandu: Tharuhat Samyukta Sangharsha Samiti (available online: http://nepaliperspectives.blogspot.in/2009/04/tharuwat-joint-struggle-committee-tjsc.html, 2 Mar 2014). Yhome, K. 2006. Madhesh Pratiko Bibhed ra Samanta Andolan (Discrimination against Madhesh and Struggle for Equality). In Madhesh: Samasya ra sambhawana (Madhesh: problems and prospects) (eds) B. Thapa, & M. Mainali, 112-126. Kathmandu: Social Science Baha.